Cornell Ornithology Lab and The Nature Conservancy have joined together to create Habitat Network, the first citizen science social network. Habitat Network is a citizen science project designed to cultivate a richer understanding of wildlife habitat, for professional scientists and people concerned with their local environments. The Network collects data by asking individuals across the country to, literally, draw maps of their backyards, parks, farms, favorite birding locations, schools, and gardens. They connect you with your landscape details and provide tools for you to make better decisions about how to manage landscapes sustainably. Service Project C253-Habitat Yard Mapping is approved for credit for FMN graduates. You can map your own yard, a local park, or other public or private property for which you have access permission. Join the VNPS Propagation Crew on Wednesday mornings to learn how to divide, pot and grow from seed a wide variety of native forbs. The native plant beds are a demonstration garden and source of plants for our spring and fall plant sales. VNPS gathers every Wednesday morning from April through October to maintain the beds and pot plants for these sales. The beds are located at Green Spring Gardens behind the Horticulture Center. You’ll enjoy light physical exertion, and have lots of fun getting your hands dirty and your spirit full. Tools and gloves provided. Join the Alice Ferguson Foundation’s 30th annual Potomac River Watershed Cleanup! 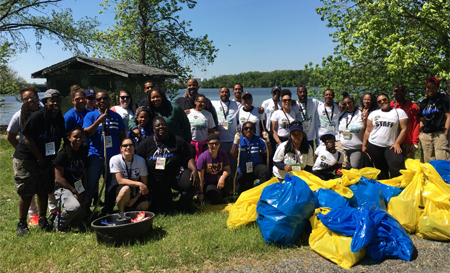 Volunteer to pick up trash at one of the many participating cleanup sites throughout Fairfax County and beyond, or better yet, get some friends or family together and organize your own cleanup – with bags and gloves provided, of course! The official day of the Watershed Cleanup is April 14th, but events will be held throughout the month of April, and even into May. Please visit the Alice Ferguson Foundation website to volunteer. See shows and talks in two tents, including live animal presentations by Reptiles Alive, Secret Garden Birds and Bees, and Wildlife Center of Virginia; and, with luck, there will be a visit from Buddy the Bald Eagle. In addition, there will be hay rides, pony rides, food for purchase, two live bands, walks to view nesting bald eagles and (hopefully) their young, a live Bald Eagle Cam, and mini-clinics by REI, Inc. Check out the booths set up by environmentally-oriented groups such as the Fairfax Master Naturalists, Audubon Society of Northern Virginia, Dogue Hollow Wildlife Sanctuary, U.S. Fish and Wildlife Service, Potomac Riverkeepers, and the Virginia Sierra Club. Weather permitting, we’ll also have a Boating Bonanza, where you can try out canoes, kayaks and stand-up paddle boards. Presented by Friends of Mason Neck State Park. Learn more or volunteer to help at the event. 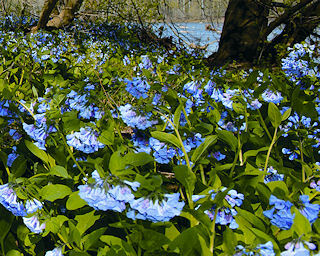 See the first signs of spring’s arrival, the carpet of Virginia Bluebells throughout the forest! These breathtaking beauties usher in springtime by carpeting the park’s floodplain with their magnificent blooms. The bluebells are so abundant in some areas you can’t see an end! Enjoy wildflower walks, face painting, live animals, moonbounce, and music. There will also be food vendors, crafts, the longhouse to explore, puppet shows and wagon rides. The cost is $7 per person in advance; $9 at the door. For more information, call 703-759-9018 or learn more here. Plant NoVa Natives needs many people to staff various tables and other events. Springtime is crazy for environmentalists! Please sign up here. No experience is necessary. 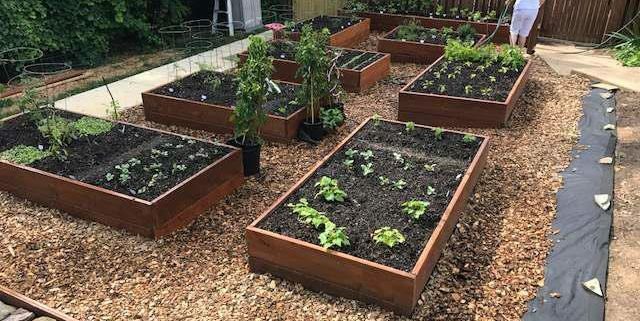 The Crisis Care Center in Annandale is looking for volunteers to tend to its healing gardens (right next to the parking lot at Fairfax Hospital). You may remove debris (fallen branches, trash, leaves) and invasive plants, place mulch, add plant, harvest produce from a vegetable garden, and water. The Center will provide lunch. Animal care, dates & times flexible – feed and care for animals on exhibit. Animal care volunteers are needed at Hidden Oaks, Hidden Pond, Ellanor C. Lawrence and Riverbend. To volunteer for Hidden Oaks programs, contact Suzanne Holland, Suzanne.Holland@fairfaxcounty.gov or 703-941-1065. For other locations, contact the nature center or park. Valerie Bertha, a certified stream monitor, is looking for naturalists to help her observe the health of Holmes Run Creek, in Annandale. Date and time: 22 April, Sunday, 9 am-noon. The group will meet at the end of Hockett Street, off of Annandale Road. If you have trouble finding the site, please call Valerie at 703-473-2789. Please also RSVP to valerie.bertha@gmail.com by 15 April so that she knows how much equipment to borrow. Wear rain boots because you will be in the creek. This service project receives credit for C020: NVSWCD Biological Stream Monitoring.